A Welcome Balm for Your Soul! 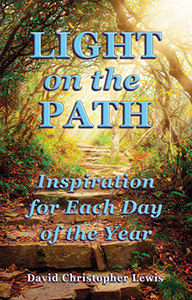 These inspirational messages will add a ray of illumination, comfort and blessing to your life as you chose to enter the path of light and commune with the Divine each day. Start off your day with a stroll into the light! David Christopher Lewis is a spiritual teacher, author, composer, and talk-radio contributor. He is the co-founder of The Hearts Center, a spiritual movement and community dedicated to helping people everywhere realize their highest potential. He conducts seminars worldwide and hosts regular online webinars and live broadcasts on diverse spiritual topics. For more information on his other published works, music CDs, broadcasts, and seminars, visit HeartsCenter.org.